​Available Rubus transcript data in GDR . Click on the Transcript Assembly name for more detailed information. Rubus is a large and diverse genus of the Rosaceae subfamily Rosoideae. Main crops of Rubus include red raspberry (Rubus idaeus), black raspberry (Rubus occidentalis) and blackberry (Rubus spp.) Black raspberries are also known as black caps. The subgenus Idaeobatus contains red raspberry and black raspberry, two diploid species (2n = 14) with a haploid number 7 and a genome size of 240 Mb. They are believed to have originated in southwestern China. Blackberry belongs to the subgenus Rubus, is tetraploid (2n=4x=28) and has a haploid number of 14. Genome size estimates of blackberry are not yet available. Blackberry and is a generic name for crops that are derived from many species and hybrids. Blackberry’s origin is cosmopolitan, occurring on all inhabited continents. Red raspberry, black raspberry and blackberry are perennial plants which typically bear biennial canes from the perennial root system. They grow as vine and shrub, climbing and sprawling. All three crops can be propagated sexually by seed, and can also be propagated asexually by tip layering and from root suckers. Rubus crops are used for their nutraceutical properties (leaf and fruit) as well as consumed as fresh fruit and processed fruit products. Plants are valued for landscaping and habitat. 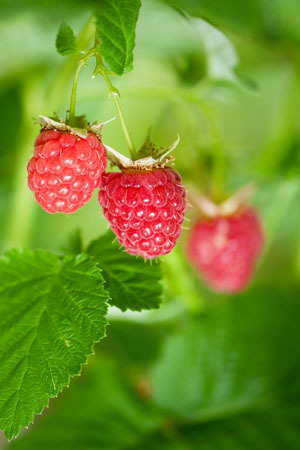 Focus of general breeding efforts of Rubus crops include heat tolerance, yield, flavor, fruit firmness, production timing, and disease resistance. Several linkage and quantitative trait locus (QTL) maps are available through GDR for the three crops.